Matching the right sound to the right room. Because when it comes to HD audio systems, one size doesn’t fit all. Cut through the static with crystal clear audio no matter where you are. From desktop speakers to meeting rooms, boardrooms to auditoriums, we have the ideal HD audio conferencing solution to complement your video conferencing hardware and software. Constantly on the go? Our range of mobile speakers turns any mobile device into an instant meeting venue. Avicom is the official supplier of leading audio conferencing brands Polycom, Phoenix, Konftel and Jabra. Need a big-venue, room-filling sound solution? We supply both Crown and Inter-M amplifiers. If big-sound mobile is what you’re looking for, our performance-grade Bose speakers, Shure and Beyerdynamic microphones are what you need. Whether it’s desktop or ceiling-mounted, we’re also an official supplier of iconic speaker brand, JBL. Whatever your sound needs, Avicom is your one-stop, fix-all destination. Crystal clear audio wherever you are. Sound tailor-made for your needs. As suppliers of both HD quality video conferencing and industry-leading audio technology, Polycom leads the way in seemless video/audio integration. Polycom® Acoustic ClarityTM technology delivers astounding voice quality and clarity from the world’s most advanced IP conference phone. 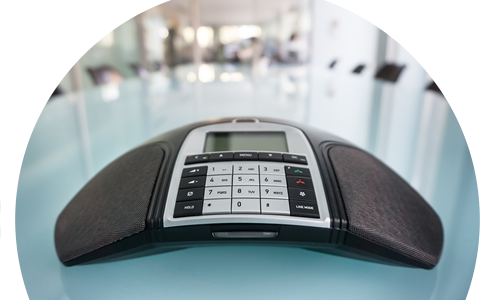 The ideal conference phone for small to midsize conference rooms. Full duplex technology for natural, simultaneous two-way conversation. From microphones, to speakerphones to audio mixers, when it comes to easy-to-use, plug-’n-play audio conferencing, Phoenix is the answer. A true high definition installed audio solution for any size conference room or auditorium. Very powerful DSP, daisy chain capability and multiple connectivity options. A powerful HD audio speakerphone. Use Spider on its own or connected to up to 14 daisy-chain units to cover larger conference rooms. Whether it’s fixed-line or wireless, small or large audio conferences, Konftel delivers outstanding audio quality across the board. Fixed-line or wireless, small or large situations, with six different models, the Konftel 300 Series covers all audio conferencing needs. With USB or Bluetooth connectivity, Jabra’s portable speakerphones integrate easily with all your mobile devices for on-the-go convenience. Slimline, lightweight portable speakers, Jabra Speak connects to your PC, Mac, tablet or smartphone. For the most innovative, reliable amplifiers on the market, look no further than Crown. Whether installed or portable, there is a Crown amp solution for you. Crown’s patented DriveCore amp technology drives powerful, pure sound experiences for any venue. Korean-based manufacturer of a wide range of audio products, including amps, Inter-M has a reputation for precision design and fabrication. Four-channel amps ideal for permanent installation in professional PA systems or for portable use for live performances. Better sound through research – Bose’s unremitting focus on innovation puts it at the forefront of headphone and speaker technology. A high-performance speaker for sleek flush-mounting in ceilings. The Bose DS 16F delivers full-range response from 90 Hz to 16 kHz and an even 140° conical coverage pattern. A surface-mount 100W loudspeaker designed for foreground music and speech. Installation up to 30ft (10m) high – both indoors and outdoors – and full-range performance from 65 Hz to 16 kHz. Systems that deliver high fidelity and extended bandwidth reproduction of voice and music for a wide range of installed applications, including retail, restaurant and hospitality operations. The MA12 column speaker excels at speech reproduction in acoustically demanding spaces like auditoriums, malls and places of worship. Wide horizontal dispersion for broad 145° coverage. Carry it in one trip, set it up in one minute, fill the room with one speaker. It’s the ultimate mobile, high-output performance speaker. From home theatres to concert halls, bring your audience closer with HD sound from legendary portable and installed speaker experts JBL. A real do-it-all portable loudspeaker system with flexible connectivity and secure stand-mounting and free-standing configurations. Premium, in-ceiling speciality loudspeaker systems that offer outstanding pattern control for consistent coverage and exceptional output. World-renowned Shure produces professional-quality microphones for a wide range of applications, from performance, to installed to broadcast. Wireless freedom made simple. Shure wireless microphone systems combine pro-quality sound with simple setup and an intuitive interface. Synonymous with precision German engineering, Beyerdynamic specialises in pro-quality audio products for studio, stage, video conferencing and the home. Designed for fixed or hanging ceiling mounting with flexible goosenecks for optimum positioning. ScudioTM technology ensures microphones are insensitive to interference from wireless communication devices like cell phones. Designed to record audio on your PC, the MPC 70 connects effortlessly to PCs via USB port. It is ideal for recording conferences, round tables or meetings with up to 10 participants. Meant for small stages, touring or permanent installations, the TG 100 set includes the 8-channel TG 100R diversity receiver and the ergonomically designed TG 100H handheld transmitter (mic).